Our passion is creating handmade kayaks, but when we're not building boats, we're paddling them. British Columbia's southern coastline has some of the most spectacular kayaking destinations in the world. From the Sunshine Coast, to the western shores of Vancouver Island, to the Gulf Islands in between, B.C. is blessed with a coastline full of private bays, sandstone beaches and protected marine and parkland. One of our favourite areas for a quick weekend paddle expedition is the Southern Gulf Islands. These islands are sheltered between Vancouver Island and the southern coast of British Colombia. They include Gabriola, Galiano, Saltspring, Saturna, Mayne, Kuper, Thetis, Valdes and Portland; along with a host of smaller islands. 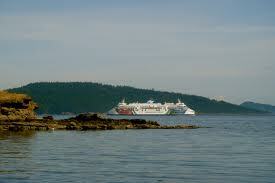 The larger islands in this group, can all be reached by BC Ferries. One of our favourite shorter paddle trips is from Swartz Bay to Portland Island. Portland is a protected marine park, perfect for one or two night paddling expeditions. If you visit these islands between the months of May and September, there is a strong possibility you will see orca whales. Large pods of resident orca pass daily between the Gulf Islands. These whales survive primarily on fish, unlike their transient cousins. If you aren't lucky enough to catch a glimpse of a rising dorsal fin, you will definitely be treated with casual greetings from soaring bald eagles, inquisitive harbour seals and docile deer. Email us your pictures and or stories from your own paddling adventures in the Southern Gulf Islands and we’ll post them on our blog.